We sell trucks, prior municipal fleets and heavy equipment. Village Truck Sales is a full-service dealership offering a complete line of Pre-owned Trucks, and Heavy Equipment. We sell, repair, and do heavy duty recovery. We are a third generation, family owned business with 70 years of service to the Community. 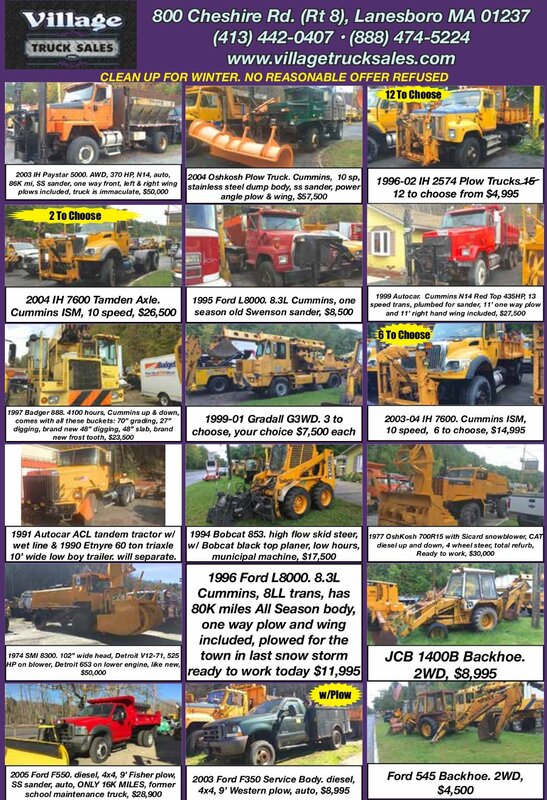 We Specialize in selling Used/Pre-Owned Municipal Trucks and Equipment. Our mission is simple, to strive to be the leaders in our market in sales, service, parts, customer support. We are committed to bringing the highest level of service to our customers. To help ensure the best service there is to offer, we believe we have the highest quality of employees and business practices in the industry.